Today I’m highlighting what women need to know about heart attack and cardiovascular disease and what you can do to reverse your risk with living a healthy heart lifestyle. The American Heart Association just issued their first ever scientific statement on Acute Myocardial Infarction In Women1 in its February 2017 issue of Circulation. An acute myocardial infarction (AMI) is known as a heart attack. The statement also covered cardiovascular disease. I will highlight the key points of the statement, but please refer to the full article for the complete report. 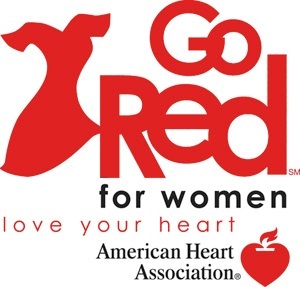 Cardiovascular disease (CVD) is the leading cause of death for women in the United States and globally. Coronary Heart Disease (CHD) remains understudied, under-diagnosed, and under-treated in women with the focus of studies being placed on men. It is important for women to become your own best advocate. Understand your risks and the symptoms of heart attack for women. Unusual fatigue, indigestion, nausea, vomiting, or palpitations. Although your signs may be subtle, the damage to your heart can be serious, and even deadly without treatment. Seek immediate medical attention if you think you may be having a heart attack. 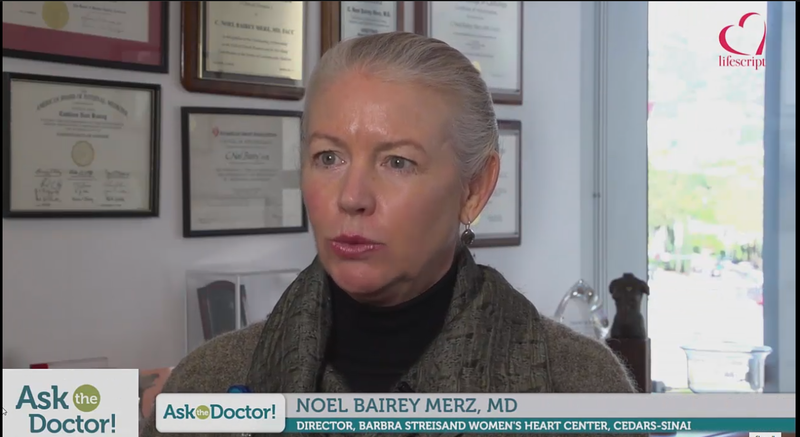 As cardiologist, Dr. Bairey Merz explains in the above video, doctors misdiagnose women’s heart attacks because women’s hearts are 60% the size of men’s hearts and the tests used to detect the enzyme to verify a heart attack is measured against male heart attack standards. Dr. Merz shares other important information as well. Ischemia is the narrowing of the arteries that lead to the heart muscle. Another name for ischemia is coronary artery disease (CAD). 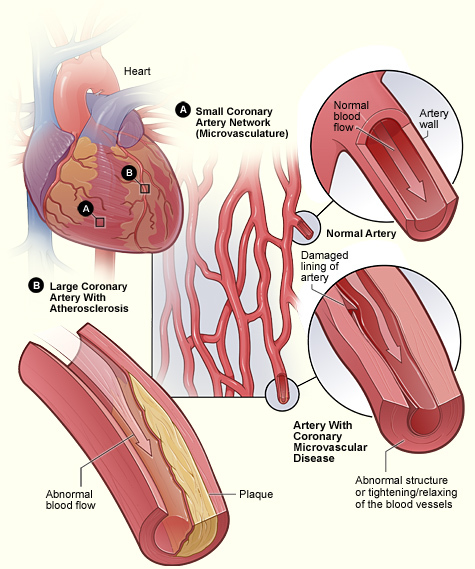 CAD occurs when the inside (the lumen) of one or more coronary arteries narrows due to plaque buildup, or atherosclerosis, limiting the flow of oxygen-rich blood to surrounding heart muscle tissue. Atherosclerosis is the process that causes the artery wall to get thick and stiff. It can lead to complete blockage of the artery, which can cause a heart attack. In women, 55% of heart attacks are caused by atherosclerosis. There are nine heart disease and heart attack risk factors that are more potent in women. Hypertension – Hypertension is a major risk factor for women with a 36% occurrence rate. Systolic blood pressure is the first number provided in your blood pressure number. Women should aim to keep their systolic blood pressure to ≤135 mmHg. Type 2 diabetes – Type 2 diabetes increases your risk 1500%. Heart disease for women with type 2 diabetes if far worse for women than men. Obesity – Obesity is a major risk factor for women and increases your risk 1300% to 1500%. If you are obese and also have diabetes, your risk of heart attack increases 5 times, or 1500%. Central adiposity – This is the accumulation of fat in your lower torso around the abdominal area. This is a function of both subcutaneous fat, which sits under the skin, and visceral fat, which surrounds the internal organs in the peritoneal cavity. Physical (in)activity – Your physical (in)activity is part of a lifestyle that contributes to other risk factors. Consistent daily exercise is a key lifestyle change that will positively impact many risk factors. Alcohol consumption – More than 2 glasses of alcohol each day increase your risk of high blood pressure, obesity, stroke and cardiomyopathy. If you binge drink, this can cause irregular heart rhythms called arrhythmias. Lipids – Lipoproteins levels are associated with long-term cardiovascular risk. However, more studies need to be done on women since current data does not specify gender. Psycho-social factors – Women suffering from personal life traumas and stress have a high risk of heart attack. Depression increases your risk 200% over men. These risks are modifiable. 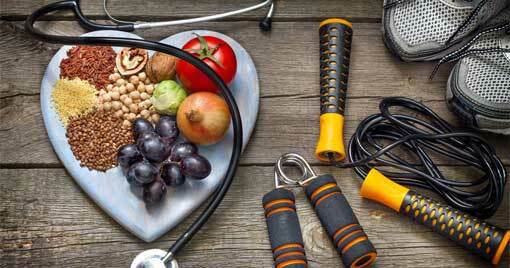 Below we discuss how to change your lifestyle to reduce your risk of heart disease. You need to be your own best advocate when it comes to your heart health. Women are far more likely to die after a heart attack than are men. Autoimmune disease – Women have much more autoimmune disease than men. And these conditions often lead to heart disease. Breast cancer – Breast cancer treatment weakens the heart. Both chemotherapy and radiation are known now to accelerate the risk of premature heart disease. If you have been treated for breast cancer ask to be screened for heart disease. Atherosclerotic risk score – Get your risk of atherosclerosis calculated each year. This [calculates] the fatty blockages that cause both female-pattern [and] male-pattern heart disease and deaths. Here’s a free app you can download to calculate your risk: ClinCalc (I-Tunes) or access it online. The GOOD NEWS is that by creating some new healthy habits you will feel much better while also preventing or reversing your risk of developing heart disease! 1. Don’t smoke. Smoking is the leading cause of heart disease. 2. Get active. Exercise for at least 30 minutes each day. Start off with 10,000 steps per day, measured by your smart phone or pedometer. As you get more conditioned, add hands weights for strength training. Combine exercise with other activities you enjoy like hiking, swimming or cross country skiing. The Meditaranian-style diet: Eat fish twice a week, have nine-to-10 servings of fruit or vegetables each day, and choose complex carbs over refined flour and sugar. Recommended by cardiologist, Dr. Bairey Merz. The Ornish Diet: This diet ranked #1 for diabetes and heart health in US News & World Report for 7 consecutive years. This is a low-fat, whole food plant-based foods. Here’s a sampler of the Ornish Diet. 4. Calm your mind. Take one hour each day to practice stress management. Consistency is more important than technique. Choose a time of day that works best. Allow yourself to experience an inner connection, a peace and an open heart through relation techniques like imagery, deep breathing or yoga. 5. Connect to love. Giving and receiving love and support is one of life’s basic needs and makes you happier and healthier. This is a special need for women as connecting helps to release stress. Take time each day to connect with family, friends, co-workers, neighbors and people in your community. Focus on good communication by identifying and expressing how you truly feel while listening to others while acknowledging their feelings with empathy, interest, concern and empathy. This video explains the science of Nrf2 activation from these 5 herbs. Learn more about this Nrf2 medical breakthrough. PS: Cardiologists say this is the best action you can take for your heart. Check it out here! If you enjoyed this post, What Women Need To Know About Heart Attack, Cardiovascular Disease & How To Reverse Your Risk, share and/or comment below!